When asked by somebody when you are a child “tell me what you want to be when you are grown up?” everybody’s answer would be certainly “A Doctor”. This is because medicine is a charming field and everyone wants to be involved in. But only those few lucky ones get the opportunity to enter into this. What makes this field so popular is the respect that you get from the people. We live in a community where doctors are still considered “God” as they can save the life of the people. There are many reason the first dream of almost all students is to study MBBS and be a renowned doctor. 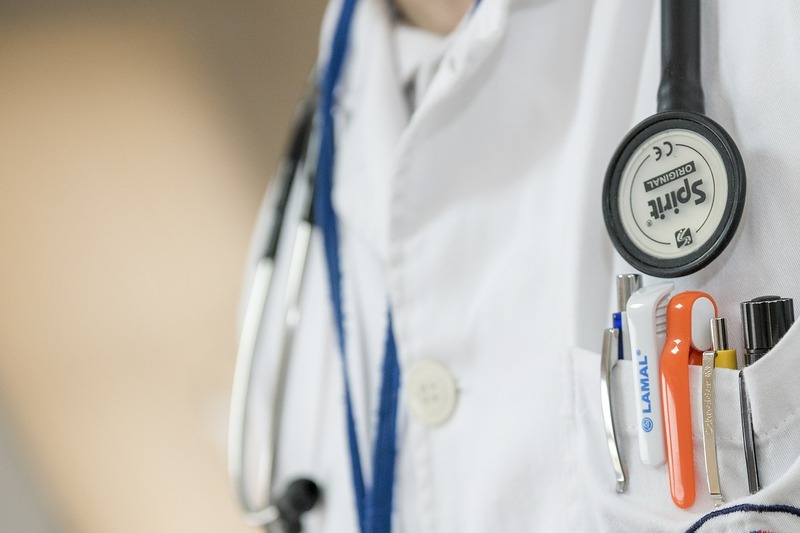 There are many Medical colleges to study MBBS in Nepal. Lots of scholarships are also available in those colleges. For scholarships of MBBS in Nepal , please surf our scholarships section. MBBS is one of the better choices for the future. Although life is hectic in this field as you might need to rush to the hospital even at the middle of the night, smile from the patient makes you forget all the pain that you get. Patient’s smile is the biggest assets that you earn in this profession. Furthermore, you will get an opportunity to work in the remote which provides you with challenge and responsibilities with limited resources. All you need is five and half year’s hard study following the higher secondary. Furthermore you need three more years for specialization and additional years for super specialization if you want to. If you really want to move in this path, there are many medical colleges in the country. Tribhuvan University and Kathmandu University have its own campus and few more affiliated colleges and does the BP Koirala Institute of Health Sciences at Dharan and Patan Academy of Medical Sciences at Patan. You need to seat in the entrance of the respective universities to become eligible for study. There are many scholarship opportunities also. IOM and BPKIHS have heavily subsidized quotas where you can study at cheaper rate. Similarly, Ministry of Education has few scholarship seats in every private medical college. To eligible for these quotas, one needs to seat in the entrance examination taken by the ministry itself. Similarly, PAHS has few seats in heavily subsidized quotas and few in partially subsidized quotas. PAHS also take examination by itself. Besides these, there are few scholarship quotas in India, Bangladesh, Pakistan and China. Indian and Pakistan Embassies take examination for their scholarship seats where as for Bangladesh and China, selection is done by the MOE. The cost to study in MBBS is around 35 Lakhs. IOM regulates the pricing and cost of the MBBS course in Nepal. 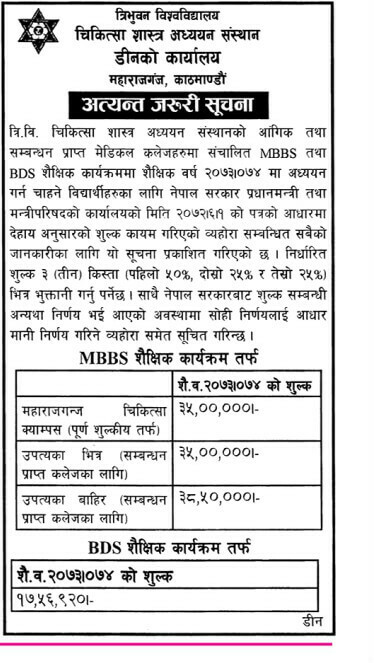 The cost for MBBS course in Nepal have been in controversy for years. Tribhuvan University, Institute of Medicine, Dean office, Maharajgunj published notice regarding the fee to study MBBS and BDS program. For Bachelors of Optometry course Click Here. How difficult is it to get selected in intrance exam of MBBS. Are BPH and MBBS PAPER same in IOM? How much should pau for the MBBS after getting scholarship ? But I have heard that MBBS costs more than 50 lakhs in nepal.Could you clarify more description abt this cost system? It is quite correct. But according to the recent news there is the provision for the scholorships to 75% students studying MBBS. In almost every governmental college there should be scholorships.